Apollo Group Inc (APOL). The increasing competition in the Educational Industry, would it be wise to consider education services in our portfolio? Among these, we are aware that ESI was abused in 2012 in which the stock went down 67 percent. Today, we will touch on the valuation of Apollo Group Inc (APOL), another Educational Services in the USA. APOL, however, reported an 11.5 percent decrease in its net earnings, principally due to lower enrollment which was down 5.7 percent; as most educational companies experienced the same scenario like DeVry and other known institutions of the same industry peers. One reason for this is the rising competition in online education startups such as Coursera and Udacity. These programs are giving the students the opportunity to take different courses without having to pay for them. How long will this industry able to sustain their operations? If you are considering investing in this kind of industry, is it the right time? Totem’s Pricing Model was prepared in a very simple and easy way to value a company. We adopted an investment style which we think applicable to the company, we looked for companies with a good balance sheet and undervalued stock price. The basis for this valuation is the company’s five years of historical financial records, the balance sheet, income statement, and cash flow statement. This is considered important because this is a great measure of the total value of a firm and is often good starting points for negotiation of a business. The concept of enterprise value is to arrive at a cost to purchase the entire business. In other words, the Enterprise Value (EV) is the present value of the entire company. Market capitalization, on the other hand, is the total value of the company’s equity shares. In essence, EV is the company’s theoretical takeover price, since the buyer would have to buy all of the stock and pay off existing debt and take all any remaining cash. The table below would give us relevant data about APOL. The market capitalization of APOL was decreasing from 2008 at a rate of -80 percent. The total debt represents 7 percent while the cash and cash equivalent were 17 percent greater than the debt. Thus, this makes the enterprise value lesser than the market value because the remaining cash was deducted to the enterprise value. Buying the entire business of APOL is paying 100 percent of its equity, no debt. The takeover price of the entire business to date, May 27, 2013, is $1.3 billion at $11.48 per share. Moreover, the market price to date was $20.99 per share. The net current asset value approach indicates that the stock price of APOL was overvalued in five years. The average 66 percent ratio represents $1.87 against the market price of $45.40, average. The stock price of APOL was overvalued in the last five years because the ratio was more than 1.2 ratio. The basic meaning of “Margin of Safety” is that investors should only purchase security when the market price is trading at a discount to its intrinsic value, in other words, the market price should be lower than the intrinsic value or true price. The margin of Safety is the difference between the market price and the intrinsic value, in other words, buying stocks when the market price is lower than its true value. Margin of Safety = Enterprise Value – Intrinsic Value. The table below shows the historical calculation for the margin of safety. The table shows that the average margin of safety on the stock of APOL was 90 percent. This means there is safety in buying the stock of APOL and can be a good candidate for a Buy. 2: the average yield on high-grade corporate bonds. The average earning per share were $3.50 and the annual growth rate was 104 percent. What is earning per share (EPS)? EPS represents the portion of a company’s earnings, net of taxes and preferred stock dividends that are allocated to each share of common stock. The figure can be calculated by dividing net income earned in a given reporting period by the total number of shares outstanding during the same term. Because the number of shares outstanding can fluctuate, a weighted average is typically used. 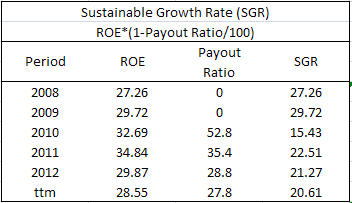 The table above shows that the average return on equity was 47.49 percent, the same as the sustainable growth rate because there was a zero payout ratio. 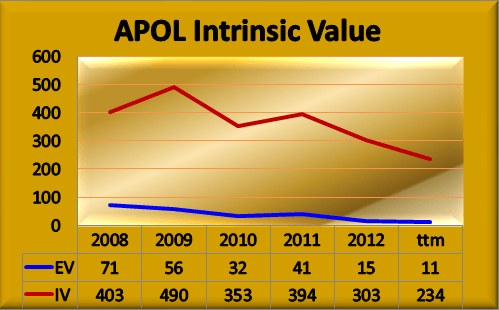 APOL is not paying cash dividends to its shareholders’ since 2008. Return on Equity shows how many dollars of earnings result from each dollar of equity. Moreover, the computations that were used in the sustainable growth rate was the relative approach. This will also affect the results of the intrinsic value and the margin of safety. There is another way of calculating, and that is by using the average approach. The table below is the summary of the results of using the relative and average approach. The table above shows the relative approach produced higher results; the average approach takes into consideration the past period’s performance of the company. If the past period is lower, the current result will be lower as well, and vice versa. The above graph above, the intrinsic value line was erratic in movement, uptrend, and downtrend, however, the overall view, it deteriorates from 2008, ranging 403 down to 234 a 42 percent drop. The graph indicates a 90 percent average margin of safety, calculating the difference between enterprise value and the intrinsic value. Whether the company is in good or bad financial condition it will show in the intrinsic value line. If the earnings of the company are stable, the IV will also show a stable line. This is because the intrinsic value factors the growth of the company. 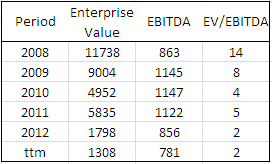 Multiplying the Price to Earnings (P/E) ratio with the company’s relative Earning per Share (EPS) and comparing it to the enterprise value per share. The P/E*EPS indicates that the overall stock price was undervalued. Because the price was lower by a 17 percent average than the P/E*EPS ratio. Thus, the stock price was cheap. Another way of calculating this valuation is by using the Average approach. The table will show us the difference of using these two approaches. It shows that the relative approach has a higher price to earnings than by the results of the average approach. Because the average approach takes into consideration the past period performance. This valuation is the separation of price and earnings in the enterprise value. The price (P/E) that was separated from the enterprise value was 29 percent. And the remaining 79 percent representing the earnings (EPS). This valuation is either over or undervalued. It is used to compare the value of the company inclusive of debt to the actual cash earnings. This measure is useful for analyzing and comparing profitability between companies and industries. It tells us how long it would take for the earnings of the company to pay off the price of buying the entire business, including debt. The EV/EBITDA tells us that it will take 6 years to recover the cost of purchasing the entire business of APOL. In other words, it will take 6 times of the cash earnings of the company to recover the buying cost. EBITDA/EV was 17 percent, meaning the earnings before tax plus depreciation and interest expense represent 17 percent of the enterprise value. The market capitalization of APOL, in general, was decreasing from 2008 at a rate of -80 percent. The total debt represents 7 percent while the cash and cash equivalent were 17 percent greater than the debt. Buying the entire business of APOL is paying 100 percent of its equity, no debt. The price was expensive using Graham’s MC/NCAV method. Furthermore, the average margin of safety on the stock of APOL was 90 percent. Further, the average earning per share was $3.50 and the annual growth rate was 104 percent. In addition, the average return on equity was 47.49 percent. The same result for the sustainable growth rate because there was a zero payout ratio. The price was lower by a 17 percent average than the P/E*EPS ratio. The price (P/E) that was separated was 29 percent and the remaining 79 percent is the earnings (EPS). This valuation is either over or undervalued depending on the analyst’s own discretion. The EV/EBITDA tells us that it will take 6 years to recover the cost of purchasing the entire business. In other words, it will take 6 times of the cash earnings of the company to recover the buying costs. On the other hand, the EBITDA/EV was 17 percent. It means the earnings before tax plus depreciation and interest expense represent 17 percent of the enterprise value. The margin of safety was high at 90 percent average. In addition, the growth of the company was satisfactory including its return on equity. Its price to earnings ratio and the earnings per share was acceptable. Apollo Group Inc (APOL) was undervalued and a good candidate for a BUY. Telecom Argentina S.A. (ADR) A Best BUY? Telecom Argentina S.A. (ADR) or TEO as their symbol, is one of Argentina’s leading telecommunication companies. As we are aware, wireless data consumption has increased due to the rapid adoption of Smartphones and tablets. With its increasing revenues year over year for the past five years and with its ample cash, the future seems bright with Telecom Argentina. The company has initiated a long position with its solid cash flows. Telecom Argentina is the principal subsidiary of Nortel Inversora S.A., a holding company that operates out of Buenos Aires, Argentina. The market capitalization of Telecom Argentina was trending at a rate of 28 percent average. The enterprise value was negative during 2012 and the trailing twelve months because its cash and cash equivalent were greater than the total debt at 2640 and 3052 percent, respectively. Its total debt was 46 percent average and its cash and cash equivalent was 187 percent of the enterprise value thus, enterprise value represents only 42 percent of the market value. Buying the entire business of Telecom Argentina is purchasing 100 percent of its equity. The takeover price of the entire business of Telecom Argentina to date, June 9, 2013, would be -$738 at -$3.75 per share, meaning zero dollars because the cash and cash equivalent are greater than the total debt. TEO had solid cash and cash equivalent in which the company had initiated its position and strength. The market price to date was $15.89 per share. Benjamin Graham developed and tested the net current asset value (NCAV) approach between 1930 and 1932. Reported that the average return, over a 30-year period, on diversified portfolios of net current asset stocks was about 20 percent. To justify this, an outside study also showed that from 1970 to 1983, an investor could have earned an average return of 29.4 percent by purchasing stocks and holding them for one year. The table above tells us that the stock price of Telecom Argentina was overvalued because the 66 percent ratio was greater than the market price from 2008 up to the trailing twelve months. The ratio represents only 1 percent of the market price. The results further indicate that the stock price was expensive because the stock was trading above the liquidation value of Telecom Argentina. By calculating market capitalization over the net current asset value of the company, we can determine if the stocks are trading over or undervalued. The result should be less than 1.2 ratios. The stock price of Telecom Argentina was overvalued because the ratios exceeded the 1.2 ratios for the period 2008 up to the trailing twelve months. A formula to be used is the Margin of Safety = Enterprise Value – Intrinsic Value. 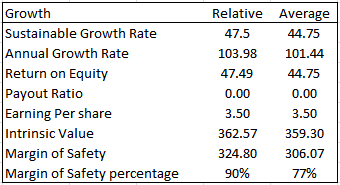 The table below shows the TEO’s historical calculation for the margin of safety. As seen in the table above, the intrinsic value factors the earnings per share and the growth of the company. The average earning per share as per the calculations above was $10.41 and the sustainable growth rate was 22.80 percent average while the average annual growth rate was 55 percent. 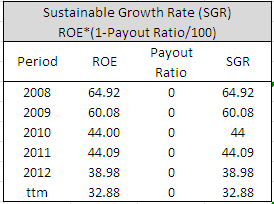 Sustainable growth rate = ROE x (1 – dividend-payout ratio). The return on equity was a 30.49 percent average, while the payout ratio was 24 percent average. 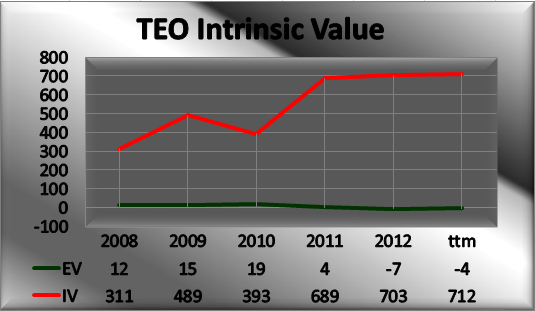 TEO has zero payout ratios during 2008 and 2009 because the company did not pay cash dividends during those periods to its shareholders. There are two ways of calculating the sustainable growth rate and that is by using the relative and the average approach. The calculations above were the results of the relative approach. But to see how the two approaches differ. As shown above, the margin of safety using the average approach has the same results as by using the relative approach. For the growth, they have only a little difference. I have prepared a graph for us to fully understand the relationship between a price and the true value of the stock. As we can see in the graph, the intrinsic value line or the true value line drops at a rate of 20 percent, then up by 75 percent in 2011 and remain stable during 2012 and the trailing twelve months. Comparing the trend to the revenue of TEO, its revenue reached 92 percent during 2012 and the trailing twelve months. If we will get the average of MOS from 2008 to the trailing twelve months we will get 98 percent, this represents the space in between the two lines. The relative valuation methods for valuing a stock is to compare market values of the stock with the fundamentals (earnings, book value, growth multiples, cash flow, and other metrics) of the stock. This valuation will determine whether the stocks are undervalued or overvalued by multiplying the Price to Earnings (P/E) ratio with the company’s relative Earning per Share (EPS) and comparing it to the enterprise value per share, we can determine the status of the stock price. The stock was trading at an undervalued price because the P/E*EPS ratio was higher than the enterprise value. The P/E*EPS was 1442 percent of the enterprise value. The other method of calculating the P/E*EPS valuation is by using the average approach. The table below will show us the difference. The calculation above shows that the price to earnings was higher in relative approach than by using the average approach. The average price to earnings was $8.53. The EV/EPS valuation indicates that the price (P/E) that was separated from the enterprise value was 15 percent average. And the remaining 85 percent represents the earnings (EPS). This might indicate that the stock was trading at an undervalued price. This metric is used in estimating business valuation. It compares the value of the company inclusive of debt to the actual cash earnings exclusive of non-cash expenses. This metric is useful for analyzing and comparing profitability between companies and industries. It tells us how long it would take for the earnings pay off the price of buying. The EV/EBITDA tells us that it will take 3 years to cover the cost of buying the entire business. In other words, it will take 3 times of the cash earnings of the company to recover the purchase price. The enterprise value was negative during 2012 and the trailing twelve months. Due to its cash and cash equivalent were greater than the total debt. Its total debt was 46 percent average and its cash and cash equivalent was 187 percent of the enterprise value. Buying the entire business of Telecom Argentina is purchasing 100 percent of its equity. The takeover price of the entire business to date, June 9, 2013, was -$738 at -$3.75 per share. Meaning zero dollars because the cash and cash equivalent are greater than the total debt. Telecom Argentina had solid cash and cash equivalent in which the company had initiated its position and strength. The market price to date was $15.89 per share. MC/NCAV valuation shows that the stock was overvalued. For the reason the ratio exceeded the 1.2 ratios, the average margin of safety was 98 percent average. The average earning per share was $10.41. The SGR was 22.80 percent average. The average annual growth rate was 55 percent. In addition, the return on equity was 30.49 percent average. On the other hand, the payout ratio was 24 percent average. Furthermore, the P/E*EPS valuation indicates that the stock price was undervalued. For the reason, the enterprise value was lesser than the P/E*EPS ratio. On the other hand, the EV/EPS valuation indicates that the stock is undervalued. Because the price represents 15 percent and the earnings were 85 percent. The EV/EBITDA tells us that it will take 3 years to recover the cost of buying the entire business. In other words, it will take 3 times of the cash earnings of the company to recover the purchase price. Overall, it indicates that the stock price of Telecom Argentina was undervalued. The return on equity was 30 percent and the payout ratio was 24 percent. In addition, the earning per share was $10.41 average. Moreover, the company has solid cash which initiated its position and strength. Therefore, I recommend a BUY on the stock of Telecom Argentina S.A. (ADR).